Former Rangers chairman Alastair Johnston has questioned whether the Scottish Premier League's probe into allegations of dual contracts can be trusted to deliver justice. "The whole process has been established to satisfy a self-serving agenda by vested interests in the SPL," he said. "I just can't sit by on the sidelines and watch a miscarriage of justice be activated by a kangaroo court." Employee Benefit Trust player payments from 2000-2011 are being investigated. And Johnston's statement came as the SPL-appointed three-man panel chaired by Lord Nimmo Smith held its preliminary meeting at Hampden. Rangers chief executive Charles Green is boycotting the process, saying that the SPL has no jurisdiction under the present club as it is now playing in Division Three. But the SPL could strip Rangers of league titles if the previous administration is found guilty of making undeclared payments to players between 2000 and 2011 and Johnston has criticised the Scottish Football Association for not becoming involved. "The SFA is the supreme governing body of Scottish football and should invoke its ultimate authority to forestall the inevitable inequity that will ensue if the capital punishment decision is left to the SPL," said Johnston. "The SFA is complicit in all of this because they have not, at least up until now, had the courage to publicly acknowledge that they either ignored or did not really understand the well-publicised structure surrounding the relationship that Rangers FC had with certain of its players." The EBT scheme run by former Rangers owner Sir David Murray is the subject of a separate tax investigation by HMRC, which has yet to release its conclusions. Johnston said Rangers had acceded to SFA requests for information about the scheme. "The SFA compliance officers must have known, both from the description and context of the reports, that such expenditures had some connection to player compensation," he said. "However, without any further investigation at the time, Rangers FC received its SFA license to compete in the 2011/2012 season. "Rangers, therefore, were entitled to believe that they were not in breach of any SFA regulation requiring reporting of player compensation. "A lawyer representing Celtic recently was successful in having charges against that club dropped because of the inadequacy of the SFA's prescribed rules, regulations, and sanctions. The same principle should apply here." Johnston believes that inflammatory and emotional words have been used to ensure that Rangers were pursued over their EBT scheme. "When the previous football commission reported on EBT's in a very high-profile statement, they took the view that, if Rangers was indeed guilty of structuring EBT schemes that transgressed the law or the rules of the relevant federations, then this was 'close to match fixing'," he said. However, the former Rangers chairman said that what Rangers did could not be compared to "bribery and corruption involving players and referees, fielding players that did not meet the criteria and qualifications of the governing bodies, or they were playing while they had been banned for previous misdemeanours". Johnston stressed that the scheme was simply a device to reduce the amount of bank debt facing the club. 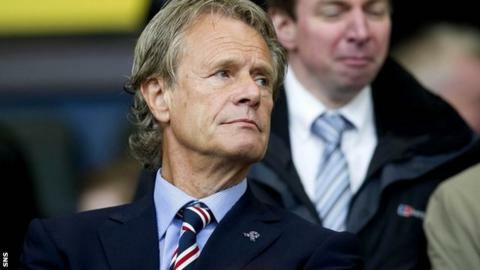 The former chairman said that Rangers went into liquidation and suffered penalties and sanctions that led to Division Three purely because of previous owner Craig Whyte's failure to pay taxes following Murray's sale of the club.